The Fish Market Restaurant, 750 N. Harbor Dr., at the Embarcadero next to the USS Midway, downtown San Diego (619-232-3474); also in Del Mar at 640 Via de la Valle, across from the Del Mar Racetrack, (858-755-2277) [thefishmarket.com]. Both locations are open Sun.–Thurs., 11 a.m.–9:30 p.m. and Fri. and Sat. till 10 p.m. Winner of numerous “Best Seafood” awards. See a separate review in Seafood, Fine Dining for their upscale Top of the Market Restaurant located on the second floor. The Embarcadero location offers spectacular waterfront views including romantic bay front sunsets. It also has indoor and outdoor patio seating and a wine list featuring more than 200 premium wines. Also recommended is the oyster bar with its fabulous exhibition kitchen and the friendly sushi bar (downtown only). These are the best seafood restaurants in all of San Diego County , and they have the awards and the attendance figures to prove it. You’ll be impressed with the 100-plus item seafood menu, cocktail bar and retail fish market, which opens daily at 10 a.m. Plus, they are so committed to quality and freshness that they actually print a new menu twice a day. The sensational fresh seafood selections may include wonderful local swordfish, great-tasting halibut, mahi mahi, succulent lobster with drawn butter, jumbo shrimp, smoked fish and more. Meals can also include your choice of delicious au gratin potatoes, roasted potatoes, french fries or fishwife rice, roasted vegetables and freshly made coleslaw or basil cherry tomatoes. You’ll love the rich, upscale decor and memorable seafood delicacies. Don’t overlook their famous cioppino! These restaurants are absolute winners! Happy hour Mon.–Thurs. in the bar with a happy hour menu. Banquets. Full bar. Credit cards: AE, DC, DISC, MC, VISA. 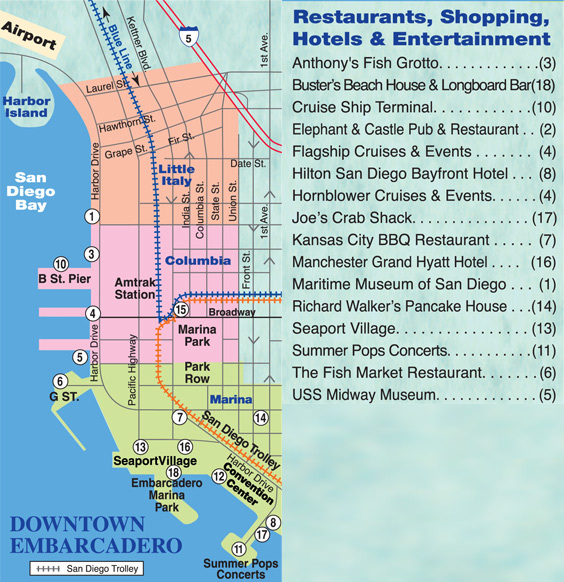 The Downtown location is located at the Embarcadero and also features the Top of the Market Restaurant (619-234-4867), which is upstairs on the second floor of the Fish Market Restaurant. Here is where fine dining and fabulous bay views are served. These restaurants with their classy decor definitely are undoubtedly some of the finest seafood restaurants on the West Coast. Winner of the Gold Medallion Award by the San Diego Restaurant Association for Best Seafood Casual Restaurant in San Diego. You’ll also be impressed with their 100-plus seafood menu, oyster bar, sushi bar (downtown only), cocktail bar and retail fish market. This place is a definite winner! The Fish Market is a great place to hold your next banquet or event. It has breathtaking bay views and San Diego's top selection of fresh seafood. You won't find a better place on the water or to impress your guests and make a memorable occasion. Available Mon.–Thurs. From 3 p.m.–6.p.m. $1.25 Oysters on the Half Shell, $5.95 Mahi Mahi Sliders, $2.95 Domestic Bottled Beer, $4.25 Draft Beer, $4.25 Well Drinks.